In the woods - Do You Speak Gossip?Do You Speak Gossip? A few days ago, T. and I went to the nearest woods to take some test photos with my new camera. With only a few minutes before the sunset, and given the fact that there were trees all around us blocking most of the light, we did our best. Promise to take even better photos next time, in a more proper time. I took my pictures for the “Forest full of plane trees” post last time I was here. Too sad to see that most of the trees have lost their leaves and fall is finally here for good. The colors of the trees aren’t so bright anymore. I told you that one of my favourite colors for cooler temperatures is grey. This is my proof. At least I kept a bright note with my fingernails. It’s mint green no. 366 by GT Cosmetics again. And yep, it’s more than two weeks old. They didn’t chip at all as you can see. They just grew, but they’re in a perfect condition. I thank Mavala’s Mavadry for this. Of course these pics were taken a few days back, so now I took it off to let the nails breathe before I paint them again. This pic was taken at the same time as the other ones. No I didn’t stay in the woods till midnight, I promise. It would be creepy. It’s because of the flash. See? 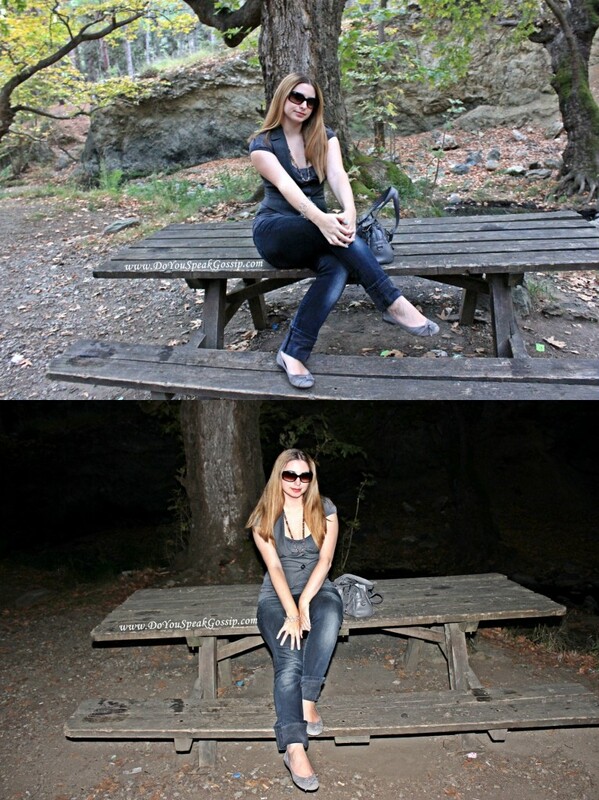 Without flash (up) – with flash (down). I prefer the ones without flash but the quality difference is huge. Hopefully the pics will become much better. Just getting to know my new camera. It’ll take some time. Thank you so much for visiting my blog, and for following it. If you aren’t already a follower, don’t forget to become one. It’s easy. Follow the links below, or follow this blog using the GFC widget on the sidebar. Till next time, have lots of fun! S’uexaristw poli Maria! Pros to paron s’autes tis photo den fanike poli i diafora poiotitas, alla ontws einai poli kaliteri auti i camera. ax…enas an8rwpos pou me niw8ei! !ki egw foraw poly gkri to f8inopwro kai to xeimwna!! poly wraio to gileko…dhlwnw fan! Thank you Alessandra! I will come by your blog asap! love the outfit!!! cuper cute!!!! i <3 the ballerinas!!!! I like what you post. please check out my blog and share some comments. S’euxaristw poli Christina mou! Fainetai oti auto to gilekaki arese se pollous hehe…den to perimena! I came here in the morning to see if you had posted something and there was no post, but as I know every 3 days there’s an amazing post, I came back again – and I was lucky, veeeery nice pictures! Amazing quality, and I must say, I didn’t see any difference in quality from “with flash/without flash” – but because of the daylight, I prefer the ones without flash, then! Hello my dear Denise! Yes, you’re right, every 3 days. Sometimes every 2. I don’t want to post more often, because I’ll run out of things to say really soon. And I want to write systematically, so my readers know when I’ll post next. Thank you so much for your nice words again. They mean everything to me. Your comments are always a pleasure to read. And your posts too of course. I’m sorry I haven’t been able to come by your blog these last days, but I’ll come asap. I’m in and out of house all the time these days. I don’t usually like flats too, but this is my favourite pair of flats. I have others too, but they keep giving me blisters. I have to buy more normal height heels, even though I don’t find them beautiful, cause I have either flats or really high heeled pairs. I hope the ones you bought fit nicely. I’m glad you like my hair. hehe I need a haircut really soon, and I need to touch up my highlights too. It’s been 6 months since the last time. I sent you an email today. I need a favour from you. If it’s not a lot to ask. Let me know! I love love love that vest! Thank you very much Sara. Yes, they are getting really long, but I need a haircut. The Mad Twins recently posted..L’Espoire est un plât bien trop vist consommé! Your bailarinas are super cute! Thank you sooo much! It means a lot to me! love the outfit, the pictures turned out great and your bag is fab! I loooove <3 The carousel is pretty unique! Thank you Nettie! What carousel? Thank you Marella! 🙂 Glad you like them! I think pictures came out really good! Love the pop of mint with the grey garments, the flats are super cute! Thank you very much Cess! Your comments are always so sweet. The grey shades look really beautiful…I totally love your flats!!! They have such a nice detail! Great photos; love your shoes! Love your Benetton vest. So cute. And the monochromatic look is working. Thank you Bad Joan. I wasn’t going for a monochromatic look, but it seems that I did it anyway. matina sot recently posted..Forever Young .. Thank you Chrysa! Yes, you know it I’m sure. It is much longer, but I’m planning to go to my hairdresser next week to cut it.